SSL Firearms Corporation will auction off a 1924 .32-caliber Smith & Wesson revolver once owned by Al Capone next month. According to notarized documents provided by the current owner, a booze runner for Capone’s gang named Charles D’Agostino stole the gun from Capone during a golf outing in St. Joseph, Michigan in 1930. The notorious gangster hid the revolver in a golf ball box, Austin Miedema, auction manager for SSL Firearms, told abc 13 News Thursday. Capone vacationed in western Michigan throughout the 1920s and owned a house in Newaygo County, an hour north of Grand Rapids. “It was no secret that Capone loved to play golf when he spent time in Michigan, and because of the constant threats he dealt with, he always carried a gun in his golf bag at all times.” Miedema said, according to the news station. D’Agostino gifted the stolen revolver to his half-brother, Dominick, in the summer of 1930, notarized documents show. 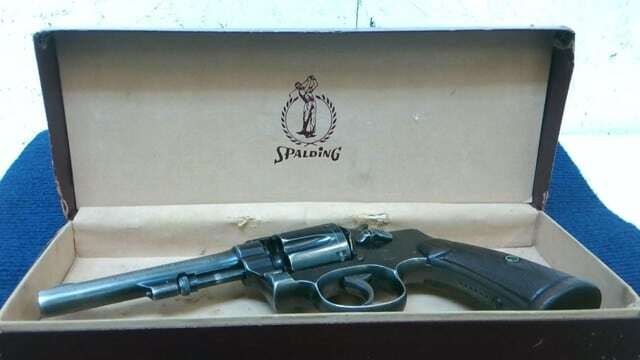 Dominick D’Agostino kept the gun for 53 years, until he sold it to a man named Robert Forrest in November 1983 for $500. SSL Firearms said the current owned commissioned the company to auction off the revolver, which he purchased on an unspecified date from D’Agostino. The online bidding will open at 8 a.m. on Jan. 9 and run for 12 hours.